Well, Mercury is not really going in the wrong direction: the planet just appears to be. So, who cares? I do. After the last week of technology going wacky, car problems, deals (my son’s) gone awry, I’m once again a believer. It’s just an illusion caused by the rotation of the Earth, like passing a local train that appears to be going backwards because you’re on an express train, moving so quickly past it. The last time a planet had any effect on us, Helfand says, is when a chunk of rock that would eventually become Mars crashed into Earth and created the moon 4.5 billion years ago. Written by two diehard skeptics who do have a lot of scientific support on their side. 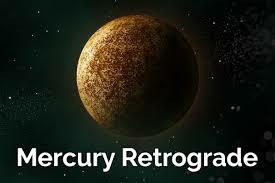 So, Mercury Retrograde officially began on July 26 of this year and runs to August 19. Whew! Less than a week to go! I lost my car keys (which I later found in a jacket pocket). My backup keys didn’t work. I called Kia. Had I tried replacing the battery? In fact, I had gone to a jeweler and had it replaced. Well, the Kia lady said. You’ll have to have your car towed to the nearest Kia dealership. Was she out of her mind? Sure, it would be free, but I’d have to wait, possibly a full day to get my car back, while the something-or-other was reprogrammed. (BTW, did I mention that this all occurred on my birthday?) Okay, so I called my closest dealership and was told the next appointment was four days away. 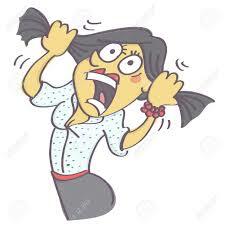 I begged and pleaded, said I couldn’t afford not to go to work (Okay, so I lied: I work at home), mentioned a week end trip I’d no longer be able to take. (Yep, I fibbed again. 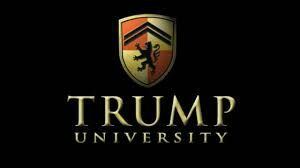 But, hey, I’m a quick study of Trump and the rest of his cronies.) The poor Kia lady put me on hold, went to talk to her boss who kindly said he would fit me in the following day. I skipped the appointment and paid a locksmith instead, dumping $80 for about three minutes of his time when he opened the spare key and saw that the new battery had been put in upside down. Oh, I forgot: after our modem went done, so did our phones. We couldn’t get a dial tone and were forced to use our cells. That issue required a visit from an Xfinity guy whose accent made it difficult to understand. In the end, after all the angst and time, the problem was a disconnected phone line in the jack in my office. Oy! Okay, by now, I was convinced that we were under the spell of a Mercury Retrograde and that our best tactic would be to burrow into a cave until the damn planet stopped looking like it was going backward. We decided to buy a new, small Roku TV to replace the one in our kitchen that was at least 21 years old. You guessed it: We got all 30 Roku stations but none of the local and national. And who watches Netflix or Amazon Prime or any of the other streaming channels in the kitchen? Not enough time. Cook a meal and head to the den where lives the big TV. 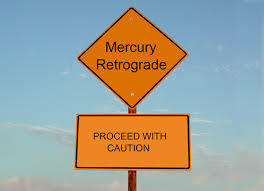 One final Mercury Retrograde disaster. Our ADT alarm system went out. 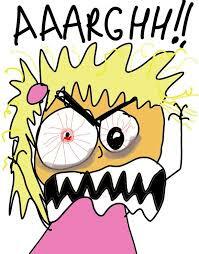 My poor husband with sensitive hearing was trying to relax after two days of MR hell when the ghastly loud alarm went off. A call to ADT did not solve the problem. And unless we wanted to have the alarm go off throughout the night, it needed to be disarmed until a repair person could fix it the next day. If we’d had a guard dog, we would have let him out of his cage to warn us of any intruders. We don’t have a dog. We left the downstairs light on. Sure, all of this could have taken place at any time. And I’m sure all those scientists out there who study this stuff would tell me that it was just a matter of bad luck. They can have their research to back them up. I’ll stick with my nemesis Mercury that goes backward four times a year. I don’t remember if that was during or after Jerry and I became lovers. Jerry was different from my husband and from other men in my past. (Not that I had that many.) He was a runner before running became fashionable. He ate all kinds of nuts and seeds and other “food” stuffs that smelled funny and tasted even worse. I was enthralled but not converted. I saw Jerry off and on during the intervening years. 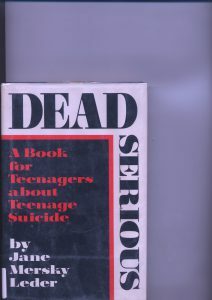 He edited the 1st edition of Dead Serious, my book about teen suicide, and was my biggest cheerleader. With the publication of the 2nd edition of Dead Serious, it seemed only right to give him a call. We hadn’t talked in what seemed like maybe two years. In fact, it was more than four, and Jerry was dead. He’d succumbed to mesothelioma, probably from exposure to all the asbestos in the walls of the houses he’d renovated. He’d been dead for four years. I don’t know if I would have visited Jerry during the four months of his illness. Probably not. I wouldn’t have felt comfortable as the old girlfriend from another lifetime. But I would have sent him emails, maybe even called. I would have told him how important he’d been in the launch of my career as a “real” writer. I would have told him how much he’d taught me about communication with other humans—and about love. I would have thanked him again for helping me make the transition between being an unhappily married woman to becoming a single woman with confidence and independence. R.I.P., Jerry, even if my condolences are four years late.